Heat oven at 375°F. 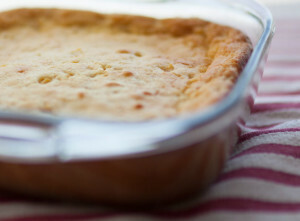 Lightly coat a 4 or 5 cup souffle or casserole dish with oil or butter. Warm milk or half and half in a saucepan until tiny bubbles form near edges of pan (do not boil). Gently stir in cornmeal and salt; reduce heat to low. Let cook for 10 minutes, or until cornmeal has thickened, stirring from bottom periodically. Mix in cream style corn. Stir in sugar and butter; remove from heat once butter has melted. Beat egg yolks (until thick and light in color) in a large bowl. Use a whisk to add hot cornmeal. In a separate bowl, beat egg whites for 1 minute. Sprinkle cream of tartar on top and beat until stiff peaks form. Note: Egg whites should remain shiny and should not separate into chunks; if they become dull, they have been overbeaten. Gently fold the egg whites into the cornmeal mixture. Pour mixture to baking dish and smooth with spatula. Bake for 35-40 minutes, or until top is golden and knife comes out clean after inserting in center.